Is this the beginning of the fresh push for ARTPOP that Lady Gaga promised her fans for the new year? If so, consider me being thoroughly here for it! 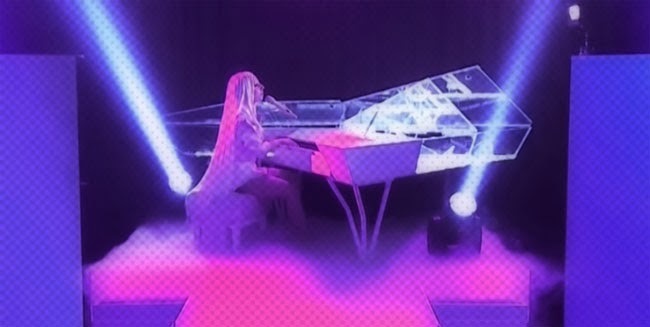 Taking the title track to The Tonight Show with Jimmy Fallon, the singer delivered the song in textbook Gaga fashion: starting the track with only a piano, and then building upon it with further instrumentation as the song progressed. The beginning was a beautiful take on the electropop song, with Gaga sounding theatrical and stunning. Even when the production stepped-up, the performance remained controlled and tight, marking a change to the chaotic feel this campaign has had thus far. Hopefully we'll see more of this from the Diva this year. Gaga, you get a gold star from me for this performance; wear it with pride! Great performance ! Finally backup singers ! I was definitely disappointed when it was confirmed before the show that she was singing ARTPOP. Not because I don't like the song but because I thought she was going to start her new single era. I went into this performance wanting to be upset and bored but I actually enjoyed it. I love me some old-fashioned Gaga with stellar vocals on a custom piano. This used to be one of my least favorite songs off the album, just because it felt boring and watered down. And what I hate about Gaga is that her songs are slow growers, and this song eventually got to me, or maybe it's just her mother monster magic working it's way into my gay mind. Either way, she did great vocally. I didn't wanna like this performance, but I did. I heard not full country, but definitely a lot more country/bluegrass influences. She says she picked up influences while she toured in America and it showed in a lot of 21. And I wouldn't mind either, she can do no wrong with that soulful voice of hers. I love when a live rendition of a song makes you love a track that you didn't think of. Lady Antebellum look so nervous listen to Adele & Darius hahaha. I really like how CMT Awards do cover performances. I'm a cover junkie. I think you guys know very well that i dislike lady gaga but i will never deny anyone of compliments if i think he/she deserves one and yes, Lady Gaga slayedddddddddddddddddddddddddddd. the vocals were amazing and artpop is a good song. overall this is a stellar performance and very fresh. I do love me some Gaga :) she is a fine singer, artist and musician. This era is proving her to be a real vocalist more than any other album she has done. I will say this proudly. Gaga has one of/if not THE best intonation I've ever heard. I've never heard someone sing so in tune before. She's also a true performer (watch Poker Face acoustic) and thus, I've gained so much respect for her. What I love most is how she looks so serene with the music, like it's a part of her soul. Gotta love it -- you can tell when there's a true musician, and Gaga is a true and honest one.